What is a class like? The children have the freedom to respond according to where they stand developmentally. So do the parents/caregivers. The environment is informal, completely free from performance pressure, and you and your children will enjoy making music instead of passively receiving it from recordings. You and your children will sing along, play various instruments, dance, and listen. Children learn that music is valuable when they observe their parents actively making music themselves. 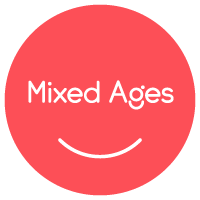 Why Mixed-age? Child development researchers recommend mixed-age groupings because it fosters natural, family-style learning. Younger children enjoy watching and imitating the older ones, older children learn by leading the younger ones, and adults are happy because the children in the family can go to classes together. Each child participates at his or her own level in singing, moving, chanting, listening, watching, or exploring musical instruments. The class provides for a variety of adult-child activities that are fun and offer new ways to play musically at home. Research shows that preschool age children who are slow to warm up to social settings are reassured by the presence of babies and young toddlers in class - the environment is less threatening to them than a setting where all children are their age or older.